Feeling the cold? Take a moment to think about the animals in Singleton Animal "Shelter"
Singleton Council pound (NSW) is what those in the animal rescue biz like to call a CRS... a Classic Rural Shitbox. In early 2016, animal advocates in the community started to complain to council that their pound wasn't meeting the community expectations that a facility given the responsibility for caring for lost, family pets should be meeting. Mainly that the pound was open to the weather and pets were exposed to the elements. In response, council promised many things. Singleton Council, in partnership with Muswellbrook and Upper Hunter Shire Council, is calling for EOIs from experienced and suitably qualified parties to provide companion animal impoundment facilities. Council’s director of planning and sustainable environment Mark Ihlein says Singleton Council, like many councils, is dealing with the challenges of maintaining ageing infrastructure. Or, to build a new pound. Councillor Sue Moore is hoping to put the “upgrading or replacement of Singleton’s animal shelter” on Council’s agenda. The community has recently raised some concerns about the adequacy of this facility. 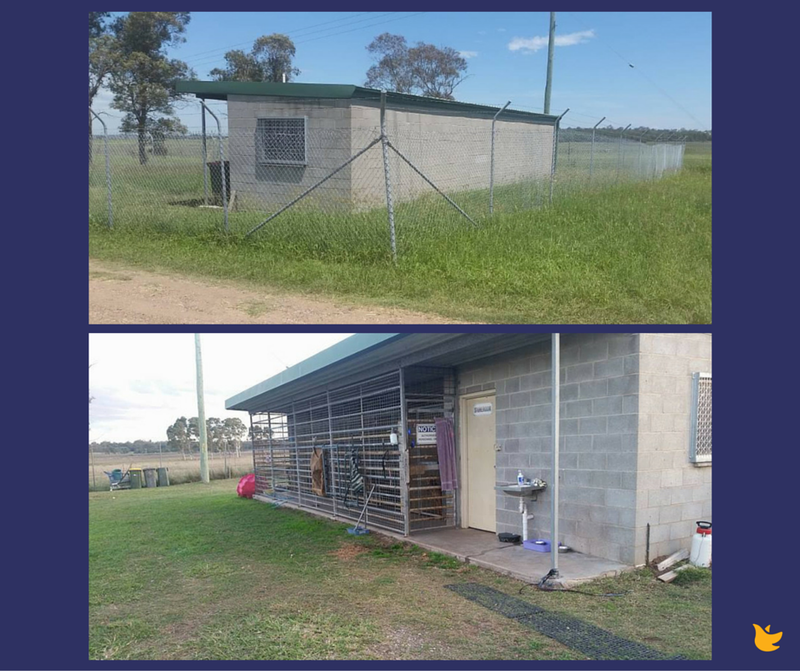 At present Singleton Council only has a small animal holding facility which is not designed to hold animals long term passed their impound date. Given the final design for the $6 million upgrade of the saleyards will be completed in the coming weeks, incorporating a new animal shelter would make sense. ... newly appointed general-manager, Jason Linanne, made a firm commitment to resolve the issue. However, in the twelve months since, absolutely nothing has been done to improve the welfare of animals being held in the facility and the pound remains a shitbox. The current facility is located opposite the waste water treatment plant off Range Road. It was constructed in the 1980’s and does not meet current expectations, or standards, as an animal shelter. Animal advocates have criticised Singleton pound over the welfare of its animals. A number of local advocates asked Singleton Council for a barrier to reduce the effects of harsh weather and to allow pets to be adopted in July last year. But Boarding Kennel - Cattery and Pound Reform Australia says little has been done about it. Animal welfare advocate Jayne Svetanoski says council should be taking responsibility for the pound’s conditions. “With this issue of this old pound, it was only supposed to be a temporary facility. it’s a very old place, its very cold. They need to fix that up. It needs to be on the agenda. it is a building they run and care for, so why can’t they do the upgrades or put in some plans for a new one to be built. The pound animals out there are still suffering from the cold winds. Nothing seems to be getting done." So the Singleton "animal shelter" literally doesn't offer pets any kind of shelter. Wind, rain, frost all hitting animals trapped in the facility. People's pets shivering through, or being baked by the elements. Due to cost, staffing and liability issues, Council has this year been forced to abandon its internal adoption program for unclaimed animals. This has not resulted in a significant increase in euthanasia figures as Rangers have continued to maintain an excellent working relationship with rescue and rehoming organisations throughout New South Wales, and have established several new contacts within NSW and interstate. Which is just. so. great. I think we all wish we could offload our daily workload onto a community, volunteer workforce, standing by willing to do this work for us for free. I mean - thank dog for rescue, eh? ... which has resulted in several new, positive relationships being established with cat rescue organisations with whom we have not previously worked. It is an unacceptable situation that any council would defend having a dysfunctional, outdated pound which allows pets to suffer. It is absurd that any council would feel that it can simply offer "killing" as a solution to homeless pets, and hope rescue will step in and save them. Help the pets of Singleton get the care and respect they deserve. Six years ago the business about a greyhound took place. 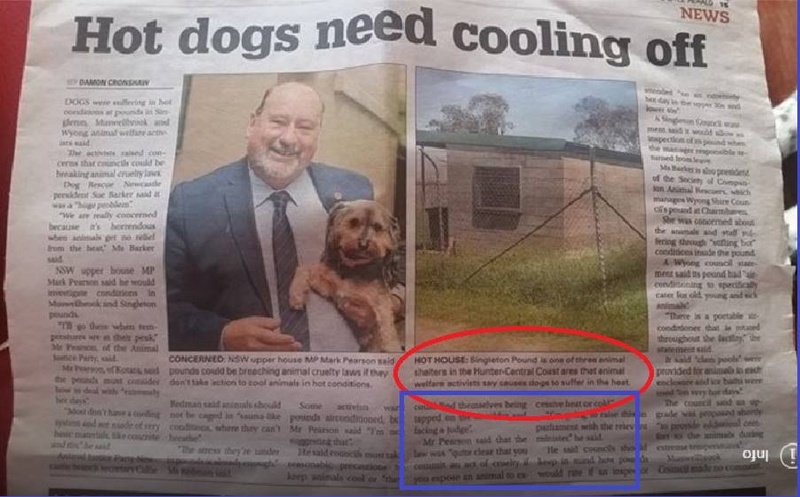 Complaints were lodged with the RSPCA but they did nothing (see link: http://www.theherald.com.au/story/466835/anger-over-distressed-dogs-rescue/). This is also a local government matter as the Impounding Act states clearly that the council has to have a pound where minimal standards must apply including vet care, food, water, etc. But the issue here comes down to one of enforcement. No-one is prepared to do it especially the RSPCA NSW. Meanwhile the Office of Local Govt is likewise just as useless. Maybe the Ombudsman needs to be brought into it."